Genetically Engineered Trait: Herbicide resistance. Sugar beets tolerant of the herbicide glyphosate (created by Monsanto) were de-regulated by the USDA in 2005**. The beets were first grown commercially in 2008. Before the first seeds were even in the ground, the USDA was being sued in California for approving their cultivation. This fall (2009), a federal judge named Jeffery White ruled that the study of the environmental impacts of glyphosate tolerant beets (part of the data the USDA considered in its decision to deregulate the beets) should have considered the economic impacts of the herbicide tolerant beets on organic farmers. Since the ruling came at the end of the growing season,*** there was no time to breed new conventional seed to plant next spring. There may be enough seed next year, but if so it’ll be a stretch. I’m keeping sugar beets on the list of genetically engineered crops, because there’s a still chance the plants will be grown next year. The judge still hasn’t decided if his own ruling should result in a ban on growing the beets. That’s all the detail I have room for here, but if you’re interested in the court case and the science behind it, I’d recommend checking out Anastasia’s excellent in depth follow up to the judge’s ruling. The sugar beet can trace its history back to 1784 when a Prussian (german, although germany didn’t exist as a country yet) chemist names Franz Achard set out to breed a beet rich in sugar. At the time most of the sugar consumed by Europeans came from sugar cane plantations in the Caribbean (sugar cane requires a tropical climate to thrive) and was sent by sailing ship across the Atlantic. In a way Franz Achard was a predecessor to the local foods movement (220 years early). Anyway, he opened his first beet sugar factory in 1801 after fifteen years of breeding, but the sugar beet really got its first chance to shine as a crop a few years later when, during the Napoleonic Wars, an English navy blockade cut the European mainland off from the Caribbean, providing a strong incentive to invest in the production of beet sugar locally. Selective breeding and the spread of cultivation continued to the point were modern sugar beets are 20% sucrose (table sugar) by weight and provide ~40% of the world’s sugar. Sugar beets are often grown in rotation with other crops to limit accumulation of sugar beet specific diseases and pests. They yield less in soils with too much nitrogen though, so they shouldn’t immediately follow nitrogen fixing crops like soybean. For a sense of which states produce most of the United States’ sugar beets, check out this great map from the USDA. [Fair warning it’s a pdf], short version, more than three quarters come from Minnesota, Idaho, North Dakota, and Michigan (in order of market share). Here’s a discussion in a Minnesota paper about who loses and benefits if the growers don’t have access to the herbicide resistant beets when it’s time to plant in the spring. *It’s complicated. 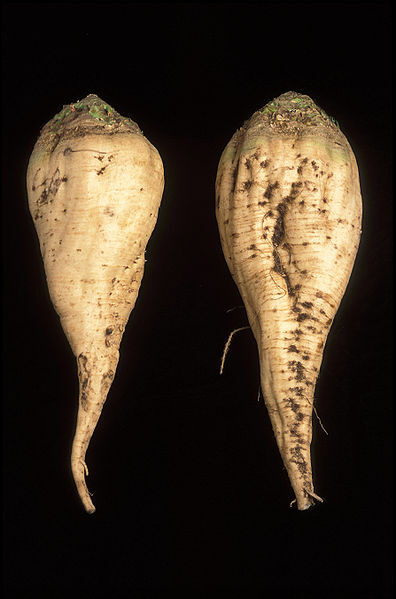 The species Beta vulgaris has three subspecies, two of which grow wild in the eastern hemisphere. The remaining subspecies is the domesticated beet which has been breed to produce the garden beet, swiss chard, and the sugar beet. Others may disagree on the subspecies classification, plant systematics is a complicated beast. The important part is wild beets grow in the eastern hemisphere and domesticated beets have been breed to fulfill three different roles. **When a new genetically engineered crop is still undergoing trials it is regulated by the USDA. Only after it has been deregulated are private farmers free to grow it. ***Seed companies would actually need even more lead time. Sugar beets are a biennial (like carrots). They spend the first year of their lives storing energy in an underground root. In the second year they burn through their own stored energy to flower and produce seed. The sugar beets that produced the seed harvested this year (and available to farmers for planting next spring) were planted in 2008. 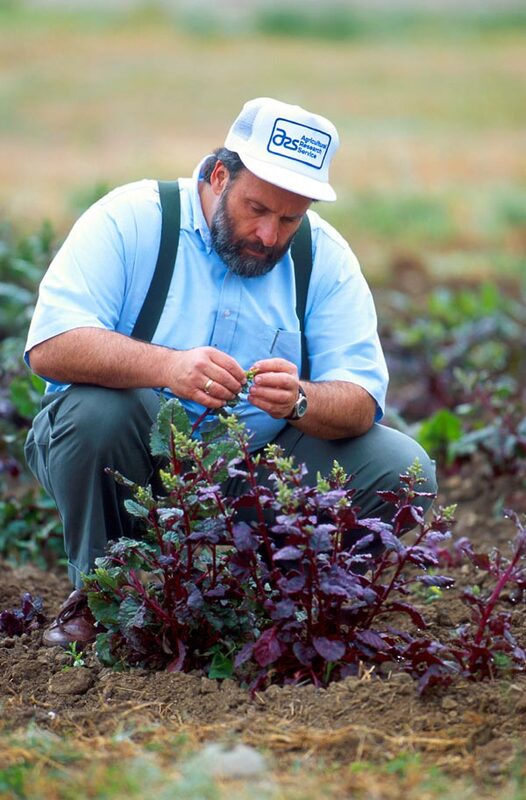 If the judge rules the genetically engineered sugar beets can no longer be planted, seed companies will plant older varieties of sugar beets for seed production next year, 2010. The plants will flower and produce seed in 2011, which farmers can use to plant their fields in 2012. That’s why the question of how large the remaining supplies of old sugar beet seeds are is so important. I’m currently growing giant sugar beets that I purchased on eBay from Robert Graves. He has a farm out in Jasper, Tennessee and assured me that these are not GMO. Is there a way to verify GMO sugar beets? Hi Walter. It is very unlikely your sugar beats would accidentally contain a genetically engineered trait. In addition to many biological realities, as far as I know Tennessee isn’t a place where commercial sugar beats are grown so there wouldn’t be any source of the genetically engineered trait. However, if you really are worried about it, you could test one of your plants. The only genetically engineered trait currently released for sugar beats is resistance to the herbicide glyphosate (the most common trade name you’ll see it sold under is Roundup although there are now lots of generic versions available). You can purchase roundup at almost any lawn and garden store. Spray it on a single sugar beat seedling. If the plant is still alive and healthy a week later it may contain the roundup resistance trait, otherwise it does not. Thanks for the speedy reply and the information, James. I guess I’m a little paranoid about GMO crops and Monsanto these days. You’re welcome! If you do decide to do the test I’d be fascinated to hear how it goes. Franz is/was my (5th) Great Granddad on my mum’s side! So glad to know he actually known by people out there, I don’t know many people where I live that have heard of him, nor Anton (he came over to Saginaw, Michigan and started the beet factories over here after Franz shared his work. Anton is also the grandson of Franz. His full name is Anton William Waldemar Achard.) Anyways, I just thought it was really neat to see him mentioned somewhere where I didn’t expect someone to know of him!